Surf, sun and sand take a backseat to the loud and lively human carnival on parade along the Venice Beach Boardwalk. There’s never a dull moment for people-watching in this sun-drenched bohemian enclave of artists, musicians, poets, singers, skateboarders and jugglers. From chain-sawing acrobats to fire-breathing cyclists, you’ll find Los Angeles at its most ostentatious, eccentric and unrestrained. Just remember to tip performers if you watch most of their show or take their photograph. While you make your way along the boardwalk’s 1.5-mile (2.4-kilometer) stretch, browse the stalls, shops and stands laden with souvenirs, trinkets, cheap sunglasses, T-shirts and sandals. Have your fortune read or get a temporary tattoo. Further along the boardwalk is Muscle Beach, best known as the place where Arnold Schwarzenegger and Lou Ferrigno (of Incredible Hulk fame) once flexed their pecs and biceps. At this outdoor gym you’ll see the toned and tanned pump iron while acrobats bend, twist and contort their bodies into eye-watering shapes. You can join them. Just buy a day pass (about $10) at the Venice Beach Recreations and Parks Office on Ocean Front Walk and then take your place to work out in front of the passing crowds. Peel your eyes away from the vivid and flamboyant spectacles and head to the beach, a three-mile stretch of well-maintained and manicured sand. The water is patrolled during daylight hours, so you can dive in if you want to do more than soak up the rays on the sand. Rent surf or body boards and catch some waves, but be mindful of other riders. LA’s Mediterranean climate makes Venice Beach a good place to be for most of the year; however, it is incredibly crowded in the summer. It is around 19 miles (30 kilometers) from downtown LA on the coast between Santa Monica and Marina Del Rey. There are plenty of city parking lots next to the beach. Check out our Venice things to do page to learn about many more activities while you're in the area. Offering direct access to the beach, this Venice apartment building is on the boardwalk and within a 5-minute walk of Venice Beach Boardwalk and Venice Beach. Santa Monica Beach and Muscle Beach Venice are also within 15 minutes. 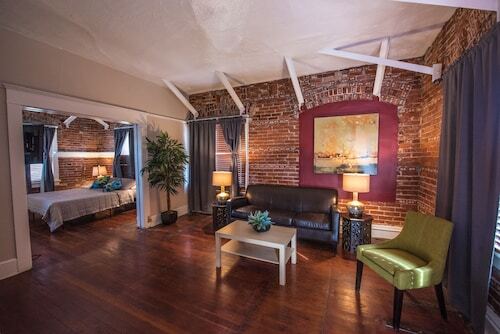 Situated on the waterfront, this hostel is within a 10-minute walk of Venice Beach and Abbot Kinney Boulevard. Santa Monica Pier and Santa Monica College are also within 3 mi (5 km). 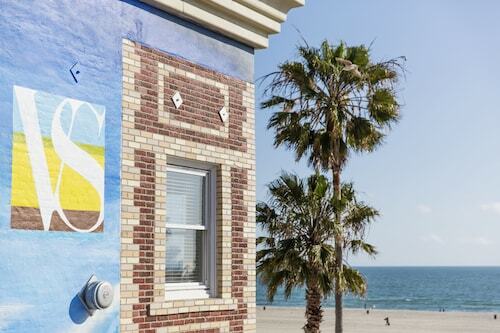 Nestled on the beach, this Venice aparthotel is within a 5-minute walk of Venice Beach and Venice Beach Boardwalk. Santa Monica Beach and Muscle Beach Venice are also within 15 minutes. Situated on the boardwalk, this apartment building is within a 5-minute walk of Venice Beach Boardwalk and Venice Beach. Santa Monica Beach and Muscle Beach Venice are also within 15 minutes. 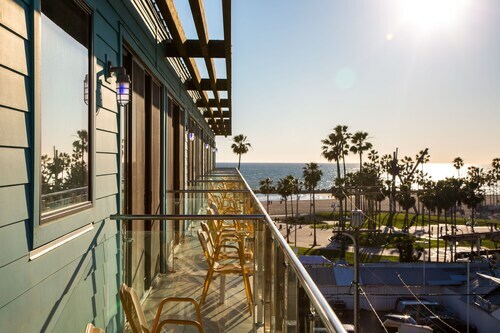 Situated on the boardwalk, this hotel is within a 5-minute walk of Venice Beach Boardwalk, Venice Beach, and Santa Monica Beach. Santa Monica Pier and Third Street Promenade are also within 2 mi (3 km). 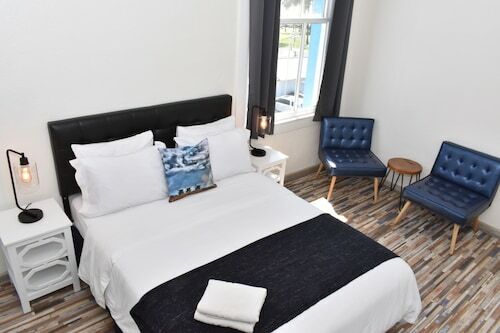 Located in Venice, this beachfront aparthotel is on the boardwalk and within a 5-minute walk of Venice Beach Boardwalk, Venice Beach, and Muscle Beach Venice. Santa Monica Beach and Santa Monica Pier are also within 3 mi (5 km). 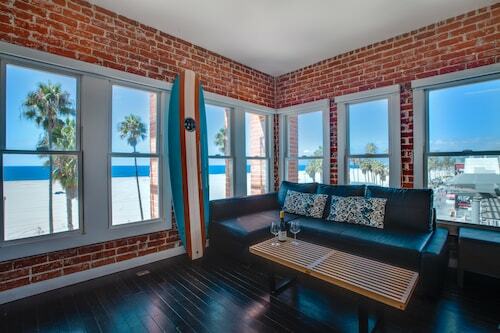 Situated near the beach, this apartment building is within a 5-minute walk of Venice Beach Boardwalk and Venice Beach. Santa Monica Beach and Muscle Beach Venice are also within 15 minutes.